For one long moment, it all stopped, sucked up by my mother’s sharp intake of breath. I am thrilled to have the opportunity to chat with Leslie Budewitz, whose Spice Shop Mysteries and Food Lovers’ Village Mysteries are always on my must-read list. First things first: check out her website for info on her books, upcoming events, and recipes — definitely do NOT miss those! In addition, she is on Facebook and on Twitter. Writers out there, she also has an Agatha Award-winning nonfiction book, Books, Crooks and Counselors: How to Write Accurately About Criminal Law And Courtroom Procedure. Just sayin’. Leslie gives a shout-out to some of her favorite books and authors, including Sheila Connolly, who writes the Museum Mystery cozy series, and Cleo Coyle‘s series, the Coffee House Mysteries, set in Greenwich Village — recipes abound there as well! Plus talent runs in the family: Leslie’s cousin is New York Times Bestselling Author Laura Childs. Leslie and I both recommend Sisters In Crime for both published and yet-to-be-published writers. Leslie is a SinC past president and credits much of her success to being a member of The Guppies, the online chapter of Sisters in Crime. I’m sorry to all the other writers out there, but “Crime Rib” = Best. Title. Ever. 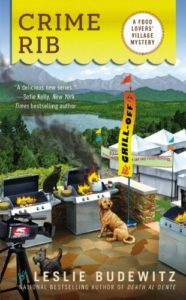 Laura Brennan: Leslie Budewitz blends her passion for food, great mysteries, and the Northwest in two light-hearted mystery series: the Spice Shop Mysteries, set in Seattle, and the Food Lovers’ Village Mysteries, set in northwest Montana. Her books focus on strong women who share her passions, and have a talent for finding trouble. Leslie, thank you for joining me. Leslie Budewitz: It’s a delight. Laura: So, normally, I write my own intros, but yours was so good that I just shamelessly stole it off of your website. It so accurately captures your heroine — strong women who share your passions. And get into plenty of trouble. I love that so much. Leslie: When passion leads you into trouble, gosh, that’s when a great story develops, don’t you think? Laura: I do. I absolutely do. So before we talk about them, I want to talk about you. You do not get into trouble. Leslie: Not the same kind of trouble is my characters. Laura: But you are a lawyer. Laura: That’s how you started out. Now, is that fun? Leslie: I enjoyed the practice. But I will say that I enjoy killing people on the page more. Laura: So you weren’t tempted to write legal thrillers? To use your legal background? Leslie: No, I never really was. I’ve been practicing law for about 30 — oh good heavens — 32 years. Now very part time, doing civil litigation, meaning personal injury work, business litigation and some employment law. And I have had some great experiences, met many wonderful people, met some not so wonderful people as well. Which is great because that gives me fodder for other stories. But I didn’t really want to go into the courtroom world in my fiction. I have a lot more interests than just the legal world. And so it’s been great fun to explore other things. If there are lawyers in my stories they tend to be herbalists, or retired lawyers who make fudge. People who have found other ways to make a living beyond their practices. Laura: Well, I love that about your books, actually. Everybody has so many different layers to them. They have — back story isn’t just the bad things that happened to them, it’s the people they were to become the people they are. Leslie: Ah! That’s a great insight, thank you. I might borrow that. Laura: You are very welcome to it. I was actually thinking specifically of Pepper, but let’s talk about your first series first. Laura: You developed the Food Lovers’ Village series. It’s set in Montana where you live. What was the impetus for that? Leslie: I live outside of a small village in northwestern Montana on the road to Glacier National Park. And Montana is for many people a place of the heart, a place imagination. It has long captured people’s imaginations and appeals to their sense of adventure. And I discovered in my travels around the country that it’s a place people think they know even if they haven’t been here. Very often, when people come to this particular community, they are stunned. They didn’t expect an artistic village. They expected cow pies in the street. They expected old, historic boots and britches West. And when they see what I call the hiking boot West, the modern West, they’re sometimes very surprised. To walk down a very narrow, small town street — we’ve only got one street in our downtown — and see art galleries and a 50-year-old playhouse and very fine restaurants surprises people. Especially because we do in fact have the cowboy West and the dude ranch down the road and all of the trappings that you think of with this part of the country. We have all that as well. And so I wanted to take that community and re-created on the page because it’s so much fun to live here I thought it would be a great place to set a cozy mystery series. And it has in fact turned out to be a really terrific choice. Readers have really enjoyed it. Laura: Well, you took home an Agatha award for Death Al Dente, for best first novel. Laura: That’s not even your first Agatha award, though. Leslie: That’s true. My first book goes back to my legal career and is a guide for writers on using the law in your fiction. It’s called Books, Crooks, and Counselors: How to Write Accurately About Criminal Law And Courtroom Procedure. That was published in 2011 and it won the Agatha award for best nonfiction, which was really surprising to me, especially considering who else was nominated that year. But it was really gratifying because it meant that I had identified a niche of writers’ needs and writers were telling me that I had filled it. And that was very gratifying. Laura: So then when you launched a fiction career, you didn’t just go for mysteries. You went for mysteries and food. Are you a foodie from way back? I’m sure it’s more than that now — and then I would turn around and look at all the covers of the magazines at the news stand. It was hands off until I finish my pizza. And then I would walk down to the corner and get a cup of Market Spice Tea and sip that as I walked through the market and looked for what I was going to eat next. So the smells and the sounds and the sights and the tastes really drew me in and I knew I wanted to learn to cook like that. It took a while, but ultimately I did. Laura: It’s fantastic that you share recipes with those of us who are less gifted in the kitchen. Leslie: I promise you that all of those recipes are easily managed by a home cook with basic, decent equipment and the desire to make them. In the Food Lovers’ Village mysteries there are no unusual ingredients because I wanted people in Montana who sometimes don’t have access to Costco and other groceries with a more varied selection to be able to make them. There’s little more adventure in the Spice Shop books. Laura: Well, that does bring us beautifully to the Spice Shop books. And to Pepper. So tell me a little bit about how you came up with this second series. Because at this point, you’ve got two Agathas, you’ve got a terrific new series launched, and you said you just not writing enough. You have to do a second series. How did that happen? Leslie: It’s kind of crazy, isn’t it? But there are so many stories in my head, I need another series to get them out. My husband and I were in Seattle, we went back there every couple of years. Now I call it research, but what I really mean is eat. I sound like I’m obsessed with food, but I sort of am. Laura: I’m okay with that. Leslie: Good, good. So we were walking around the city and I was thinking that it would be the perfect place for a second series. Now, writing an urban series, an urban cozy mystery series, is a little bit different than writing the small town series like the Food Lovers’ Village Mystery series. Most cozy mysteries are set in smaller communities. But there are a handful set in big cities. And the thing that makes them work is they tap into a community within a community. For example, Sheila Connolly writes the Philadelphia Museum series. Well, it turns out that Philadelphia has this culture of small museums and so her character works with the Fire Engine Equipment Museum and the Toy Museum, and a Revolutionary War Families Museum and places like that. She creates this community within the community. My cousin, Laura Childs, writes a scrapbooking series set in New Orleans in that community that is focused on fabric and costumes and beads and all the craziness that is uniquely New Orleans. And there are other cozy series. One of my very favorites is Cleo Coyle’s coffeehouse mysteries set in Greenwich Village. Good heavens, there’s hardly a more vibrant, intense, packed part of the world in Greenwich Village. And out of this coffeehouse community, she creates this whole series. So when I thought about Seattle, it was really clear to me that the Pike Place Market was exactly that sort of community within the community. Laura: And that works really well with what you do well, which is you build community and you build relationship. Specifically families, and I mean the families we create not just the families we are born or married into. Leslie: Thanks for the compliment. The community aspect of the cozy is sometimes, I think, underemphasized. And ultimately to me, that is what the cozy — it is about an amateur sleuth who pursues an investigation because she has insights into the community that allow her to solve a crime because she knows and sees things and can ask questions and go places that the official law enforcement investigators can’t do. So their job, the official law enforcement investigators, their job is to restore external order. Hers is to restore internal order and knit the community back together. I like that you mentioned both the families that we’re born into and the families that we create. In the Food Lovers’ Village Mysteries, my girl, Erin Murphy, is very close to her family. She grew up in Jewel Bay, she left for a few years, which is a common Montana story, and then came back. That’s actually my story. And I wanted to explore it through a much younger woman. Most of her family is still here, so they have a lot of interaction with them. In fact she works with her mother in the business, which creates some inherent tension. In the Spice Shop mysteries, Pepper doesn’t have as much interaction with her family until book three, when her mother visits from Costa Rica, where she and Pepper’s father have retired. And we also meet Pepper’s brother as well. But what we have is that family she’s created with her friends in the spice shop and with her flick chicks, the women that she watches movies with every week. Pepper had a very unusual upbringing and that created kind of a different sense of family. So it’s fun to explore those two different aspects. Laura: I also, I do like your mother-daughter relationships, it’s very affectionate — exasperated affection on occasion. Laura: Back to your recipes. It’s not just the recipes, I’m learning so much from you, especially in the Spice Shop mysteries, because you don’t just give us just a little bit about ‘use cinnamon here,’ you give us the entire history and fun facts and great uses and exotic peppers and — it’s just amazing. Were you, did you pick up on spices when you learn to cook or did you concentrate on spices when you decided to do these mysteries? Leslie: A little bit of both. I told you the story about walking through the market and stopping at Market Spice for a cup of tea. I started buying a spice, or another spice, or an herb, or a combination, and trying to learn to cook with them, and figure out what they were. Because I grew up in a household where the spices were salt, pepper and cinnamon, and occasionally bay leaf. So it was an exploration process for me. But then when I started writing the books, I started learning the history of spices and why the cinnamon that I got in the grocery store and the cinnamon I bought in the spice shop smelled and tasted very different. Well, that’s because grocery store cinnamon is probably cassia, which comes from a different plant. It’s similar but it got a darker, slightly harsher, more bitter tone to it than a true cinnamon will have. Now there are different cassias and different cinnamons, and if you blend them in a certain way, particularly if you had certain kinds of sugars, you get a whole different flavor. So I started exploring that and I’ve got a small, a very small library of books on spices. And they’re just so fascinating! And I think if I found them interesting, my readers would too. The challenge of course is to not go on and on and on, which you can tell I love to do. Laura: Your other passion, helping other writers. First of all, you’re incredibly prolific, you are on so many blogs, you’re such a helpful force, but you’re also a past president of the national Sisters in Crime. Laura: What drew you to it? Leslie: Sisters in Crime, gosh. It is the best writers organization on the planet, don’t you agree? Leslie: I remember how I first learned about it. A friend of mine brought me a copy of the Sunday Missoulian, which is published in Missoula, the biggest city in western Montana. And there was, in the books section, a small article on Sisters in Crime and Mystery Writers of America. And I had just started writing my first mystery, one that’s in a box in the closet, where it shall stay, and I thought, I should join those organizations. So I joined Sisters in Crime, and these were the days before email so we got newsletters and in one of the newsletters was an announcement about a group of writers wanted to start a group for unpublished authors, unpublished writers. And I joined that and it became the Guppies, which stands for the Great Unpublished, and it still exists today. It now has more than 600 members, it is by far the largest chapter in Sisters in Crime. And the Guppies was really a catalyst for me in so many ways. In those days, before the Internet, we had trouble finding information about the craft in the business. Now the problem is we have too much information, so an organization like the Guppies, which is part of Sisters in Crime, or any other chapter can help you weed out what you don’t need to know and focus in on the information that’s most useful to you. And so I can say without any hesitation that I am a published author because of friendships I made in the Guppies and things that I learned from my sisters in the Guppies chapter. Laura: It is, community is necessary. People think of writers as sitting at our computers now, our typewriters before, and just typing away all by ourselves. Which has to happen, but without a community you don’t get beyond that. Leslie: That’s absolutely true. Every good thing that has happened to me as a writer, has happened because of a group. Even though the work itself happens with me in the cat. Laura: You’re also incredibly prolific. You blog on your own website, LeslieBudewitz.com, but then you also blog on other sites. You blog as your characters. You have two series running. You contribute to cook books and you tour. I want to know if you have a time-turner somewhere, I want to know what your secret is. Leslie: I’d like one of those time-turners! Hermione is one of my favorite characters in fiction and that time turners definitely one of them. Thanks for saying all that, I admit sometimes, and today’s one of those days, I feel a little overwhelmed by everything I have put on my plate, but I wanted this. This was the career I wanted. And it is just turning out to be a delightful opportunity. 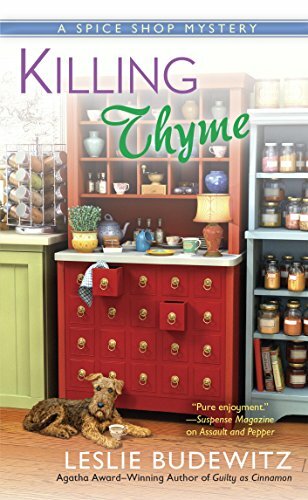 Laura: So now you’ve just launched your third book in the Spice Shop mysteries, Killing Thyme. Laura: How did you come up with the story for that one? 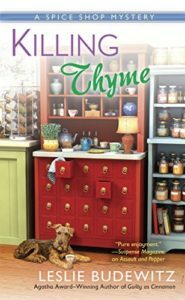 Leslie: Killing Thyme was, arose out of a challenge I set myself. I wanted to write a book with a cold case in it, and I also wanted to explore Peppers childhood. As I said, it was unusual, she grew up in what she refuses to call a commune, but it sort of was one. It was a peace and justice community that her parents and her friend Kristin’s parents started on Capitol Hill in Seattle in the early 1970s. And I drew that from a community that I was aware of much later, in the late ’80s and early ’90s, but that had started out about that time. So these two couples lived in this big, old ramshackle house on Capitol Hill, raising their young children and working in the peace and justice community. They start a food bank and they start a meals program at the Cathedral, they work with other groups to start community mental health clinics and medical clinics in daycare’s and that sort of thing, the sort of thing that really was happening, not just in Seattle but in many many cities around the country and the time period. Well, that’s an unusual way to raise children, especially when you’ve got other people moving in and out of the community. And so I thought about, what could go wrong? What about people who were not quite in tune with the same vision that Pepper’s and Kristin’s parents had had? People who maybe had a little more violent tendencies than they did. And I thought about what opportunities there would have been for division within the community. And that’s where the storyline came from. I don’t mean to be vague, but it’s always difficult to talk about a mystery and not give away anything. Laura: Absolutely, we do not want spoilers. But I do love that it, this one I think really explores the themes of community and it gives us new insight into everyone, especially Pepper, I think. I love it. So there you go, that’s not a spoiler, you can tell. Leslie: Well, one of the themes of the Spice Shop series is identity. And in some cases very literally, characters are not who they think they are. They’re not who we think they are either. And another one is what happens when you try to protect people and it goes too far? Overprotectiveness. So those kinds of themes come out in the connections between the individuals as well. I hope. Laura: Oh, absolutely. Leslie, thank you so much for joining me today. Leslie: Laura, thank you. It’s been a delight.